From left: Chip Bowling, Chairman of the U.S. 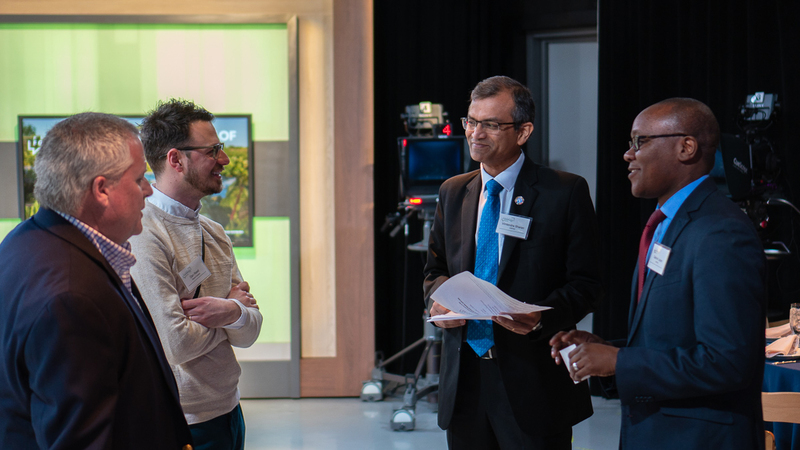 Farmers and Ranchers Alliance, meets with Planet Forward Director Dan Reed, Vimlendra Sharan, Director of the FAO of the United Nations Liaison Office in D.C., and Gabriel Lazier, Strategic Partnerships and Outreach Coordinator in the D.C. FAO office. Planet Forward founder Frank Sesno kicks off the Salon and introduces our guest speakers. 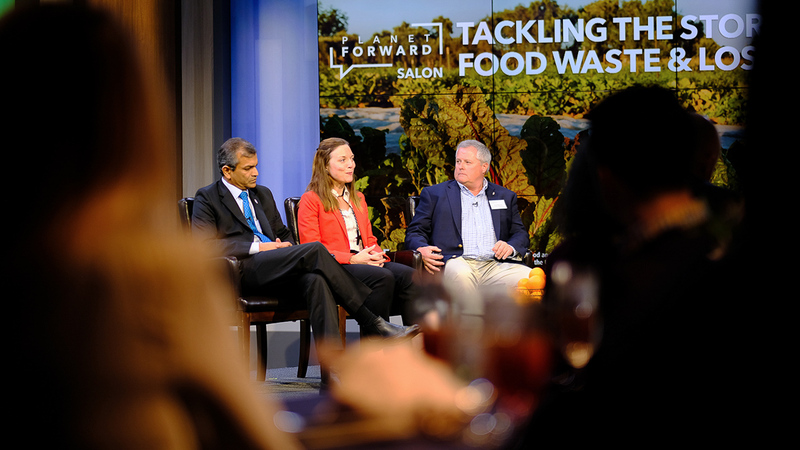 Vimlendra Sharan and Chip Bowling are joined on stage with Meghan Chapple, Director of GW's Office of Sustainability. The event was filmed and streamed live on the Planet Forward Facebook page. 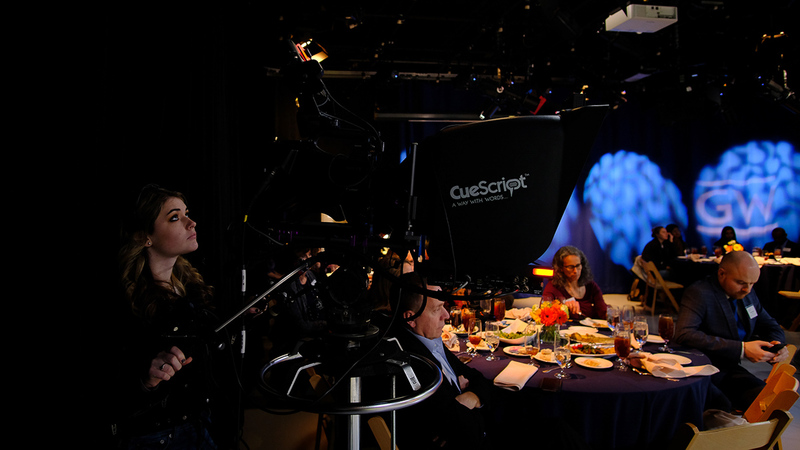 A student with GW TV operates one of the cameras used for our live stream. School of Media and Public Affairs Assistant Professor Dr. Imani Cheers takes notes during the conversation. Last Call innovators approach the mic to talk to the panel and audience about their idea and app. Last Call co-founders, GW alumna Erin McGeoy and GW senior Chloe King, laugh at a comment from the panel. Sesno sums up the Salon with a question for each of the panelists: What should we as individuals do to address food waste and loss? Food waste is a growing problem across the globe. Humans throw out 1.3 billion tons of food annually, about a third of all food that we grow. While food waste costs us an exorbitant amount of money, time, and energy, it’s also harmful to the planet. If food waste was a country, it would be the third-largest contributor of greenhouse gases. 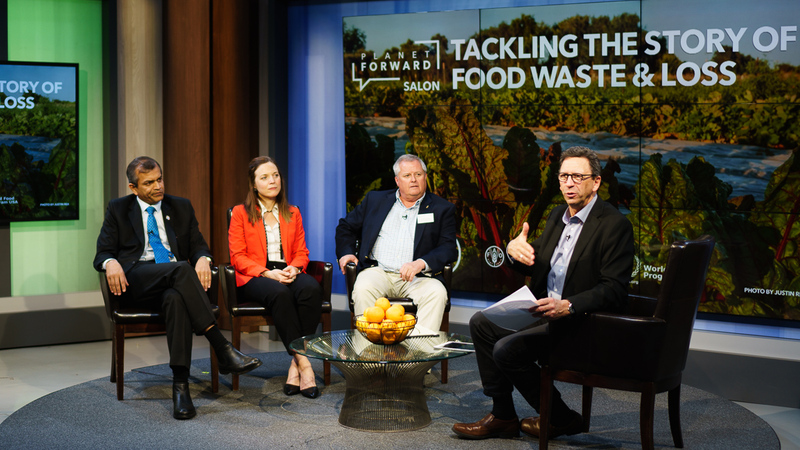 At the Feb. 13 Planet Forward Salon on tackling the food waste and loss problem, experts Chip Bowling, Meghan Chapple, and Vimlendra Sharan joined host Frank Sesno to lead the discussion on the topic. 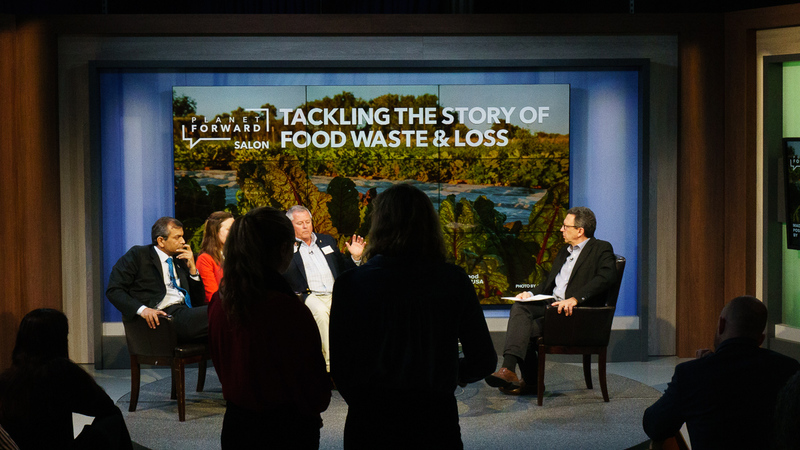 This event brought students, professionals, and policy leaders in the field together as the conversation covered how to combat food waste and loss here in the U.S. and abroad — and the challenges and potential solutions for each. 1. Food waste is personal. Everyone has wasted food, or has seen it happen. The way we grow, sell, and consume food must fundamentally change if we are to sustain our growing population and reduce the carbon footprint of food waste. A cultural shift must occur in order for this to happen. In developed countries, we waste as much food as sub-Saharan Africa produces in a year. Food waste is one of United Nation’s Sustainable Development Goals. 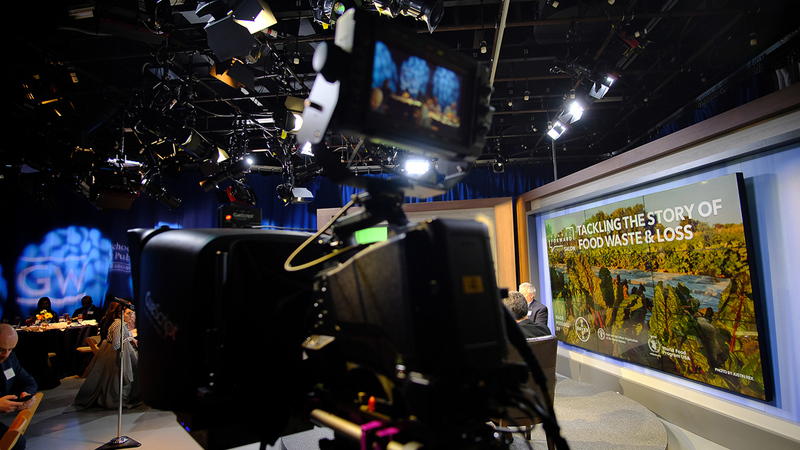 Partnered with the World Resources Institute, the U.N. aims to halve total food waste by 2030, and to do so the problem must be tackled at both production and consumption levels. Food losses compared by geographic region, 2015. Courtesy of the World Economic Forum. 2. Food loss is different from food waste. According to UN-FAO Director Vimlendra Sharan, 35% of food is lost between delivery and retail sale. Produce is easily damaged en route to supermarkets, and retailers will reject food for aesthetic reasons, such as bumps on vegetables or a slight discoloration of fruits. The top three food groups in terms of share of total value of food loss are meat, poultry, and fish, followed by vegetables and dairy products. Startups like Local Cowboy help match food delivery services with charities and food banks in the area. On a policy level, incentives like the Good Samaritan Food Donation Act encourage retails to donate food with liability protections. Currently, there are no financial penalties in the U.S. for wasting food. 3. 28% of all variable land contributes to total food waste. It’s not just the food we are wasting—it’s the water used to cultivate crops, the energy used to harvest it, and the fuel consumed to transport our food. About 1.4 billion hectares of land (about 3.5 billion acres – the equivalent of about 1.7 Brazils in land mass) is used annually to produce food that is lost or wasted. 4. Students are leading innovators of food waste solutions. College students are on the forefront of implementing sustainable changes in their communities. Last Call, for example, is an organization founded by two innovators from GW: alumna Erin McGeoy and senior Chloe King. Last Call shares end-of-the-day restaurant deals with members of the community. Food that otherwise may be thrown away is sold to subscribers at a discounted rate, anywhere from 50% to 70% off, benefiting both the vendor and the consumer. 5. 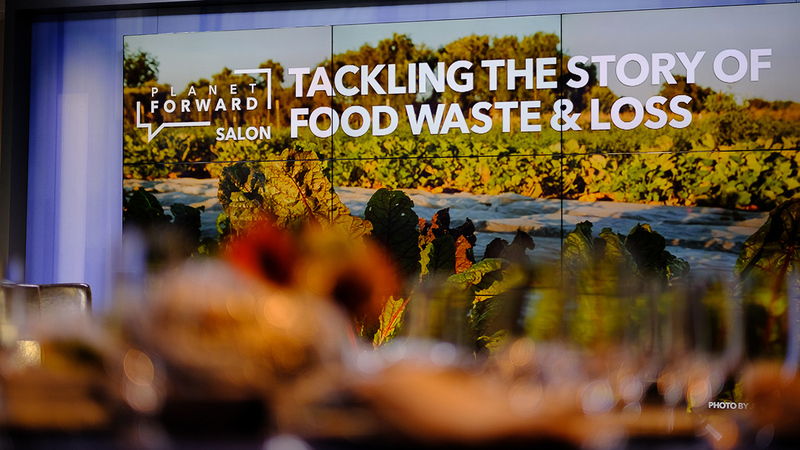 How we communicate the story of food waste is key. 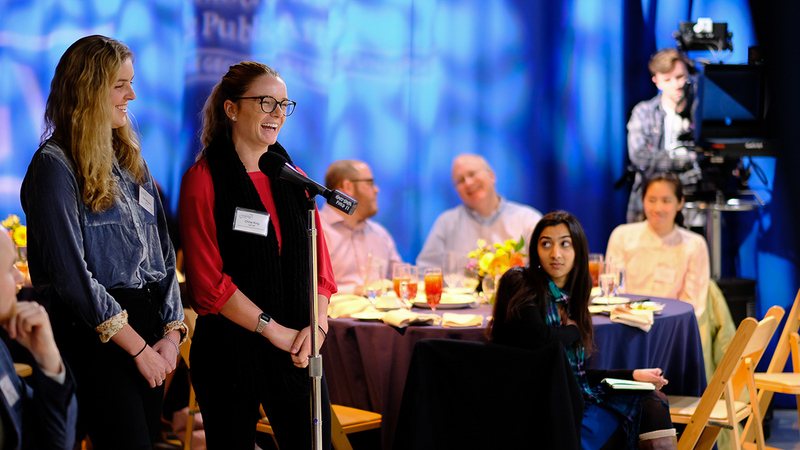 “People aren’t thinking about how they are connected to the planet,” said Meghan Chapple, Director of GW’s Office of Sustainability. Food is an afterthought in urban metropolises since city dwellers are so far removed from the production of the food they eat. Many colleges like GW have opened community gardens and kickstarted on-campus compost programs to bring students closer to their food. The panel agreed: Guilt and shame aren’t effective when it comes to changing behavior. 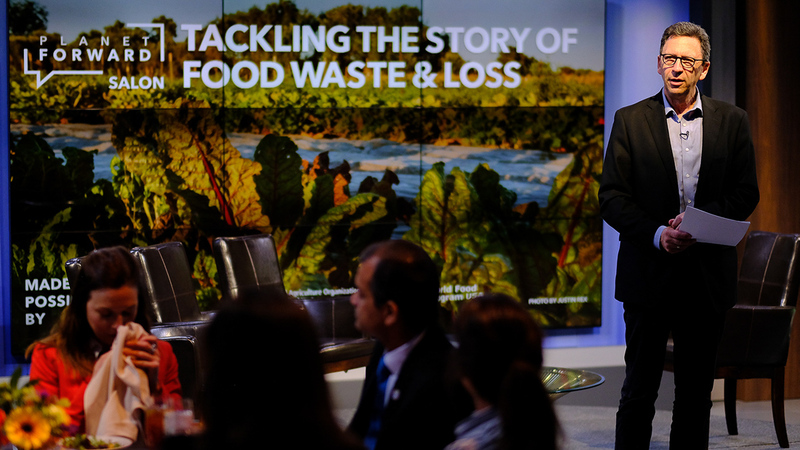 Telling a story on food insecurity or sharing a personal anecdote is a compelling way to convey the real challenges of food waste. All across the supply chain, we must work together to curb food waste and better appreciate what we consume. Did you miss the salon? You can still watch the live stream via Facebook. Don't miss out next time! 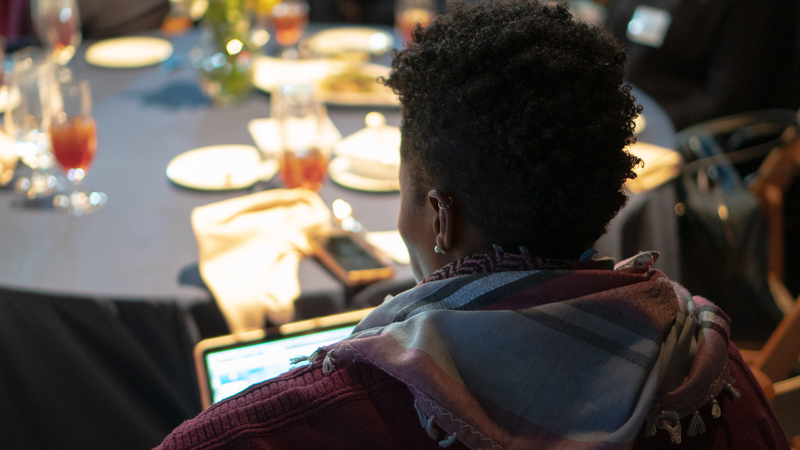 Sign up for our weekly newsletter to get alerts about events like Salons, our annual Planet Forward Summit, and the latest stories from students across the country!